Android devices have the power to instill fun and entertainment within your life. Of many exciting apps available on Play Store, there still exists some uncanny apps responsible for the complete makeover of your picture. These apps are loved and adored by everyone from adults to kids. With these apps, creating funny faces is easy and entertaining. Face Swap is one of the most popular funny faces app currently enjoying a strong fan base and a huge popularity. Not only is the app loved by the audience by it makes it to the list of the top 250 trending apps in Google Play Store. The app is fairly decent and fun to use. Deemed as the best funny faces app for an Android smartphone, Face Swap can be enjoyable and entertaining. Apart from being completely free, Face Swap also boasts a host of free features like motion stickers and cartoon faces. The app is adored by the kids as well as the adults. Using the motion swap on Face Swap, you can swap your face with real-time and click some of the most insane and hilarious moments using your front camera. Not only can you swap your face with your friends and family but also with superstars, celebrities, and cute animals. 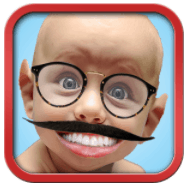 When it comes to funny faces, Funny Face Effects is a must have app for your Android phones. Not as good as face swapping, but Funny Face Effects offers some decent and enjoyable features for kids and adults alike. The best part of this app is that you can create a plethora of funny faces depending on your mood. It is relatively simple and easy to use. All you must do is click your face and apply an effect from a catalog available on Funny Face Effects. You can choose to look bald and fat or ugly or anything you want. More importantly, you can select pictures of your friends and family and give them a total makeover creating some sweet memories and moments of enjoyment. Besides creating funny faces, it also allows one to wrap, move, stretch or distort an image. If you are on the lookout for an app which can give your face a complete makeover, we suggest you try the Face Changer app available for Android platform. The app is elegantly simple to use and is full of funny faces and cartoon filters to give your look a complete makeover. The exquisite set of features and effects available on this app are truly phenomenal. One does really enjoy manipulating their entire face or certain parts specifically. Yes, with Face Changer you get to change any face you wish to. One can change certain parts of the face separately as well. These parts can be manipulated or changed with special funny faces so that they look fun and amazing. One can even change the structure of their eyes or nose. You also have the option to apply effects to them to make the look bold or funny. The best part is that you can make your face look thin or fat, turn your ears pointy and add amazing crafty effects to different elements on your face. The app is surely awesome in terms of creating absolutely hilarious faces. Another app to make to the list of the best funny faces Android apps is Funny Face Maker. The app is completely succinct to stand up to its name. Moreover, the app is absolutely free to use with no additional costs. If graffiti and fun are what you seek, Funny Face Maker helps you do the same thing with faces. 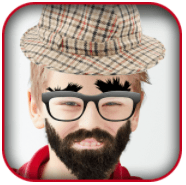 Funny Face Maker combines a variety of functionality making it funny and entertaining to use. With this app, you can create some of the amazing, funny faces from preloaded photos in your gallery. Be it, family or friends, just pick up their pictures from the gallery and give them an entertaining twist like never seen before. 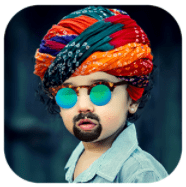 Funny Face Maker helps you change photo effects and colors with ease and simplicity. You can also crop the photos, add frames and resize the photos. Conclusively, Funny Face Maker strikes a perfect balance between funny faces app and a photo editing app. So download Funny Face Maker and make some of the crazy faces of yourself, friends and family. Creating funny faces is a simple art thanks to a plethora of Android apps available on the market. Funny Face Changer is another Android app for creating funny faces from your pictures. The app is extremely simple and easy to use. Now turn the faces of your friends and family into a laughter riot with Funny Face Changer. The app allows you to select pictures from gallery or directly export a picture using the camera. The app supports a funny editing lab. The editing dashboard on Funny Face Changer is admirable for the innumerable effects and tools it consists of face changing. 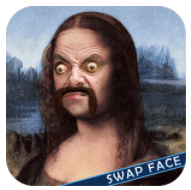 The app also boasts of some seriously funny effects to be loaded up and used to change the entirety of a person’s face. Moreover, users can also choose from a wide range of stickers and clip-arts to add to their photos. The best part is that the stickers are resizable thereby giving them a more natural and realistic effect when applied on a face. Thus Funny Face Changer is truly a face changing app. Realistic stickers of mustaches, beard, etc. With the animal filters ushered in by Snapchat and Instagram, the audience has been awfully cheery about them. 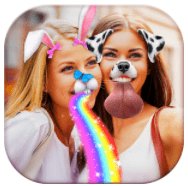 But to satisfy the overdose, the Android marketplace offers Animal Face Photo App. Yes, you heard it correctly, and yes, it does exactly what the name says. Another funny faces app on the Android ecosystem, Animal Face Photo App is one of the free apps for animal stickers. Now you can easily choose from different animals and get them around your face with a tap. Choose your favorite animal filter and wonder how your face would like for that animal. The app is popular amongst teens and kids for the wide array of animal stickers supported by it. Moreover, the faces look really funny and adorable with the animal filters applied. You can choose from cat faces, fiery lion faces and a lot more. Besides the amazing catalog of animal filters, Animal Face Photo App also boasts of photo editing tools for rotating, zooming and swapping faces. The app also provides flexibility to share your photos with your family and friends across different platforms. 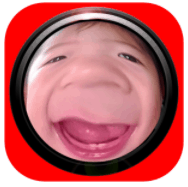 For those Android users on the lookout for a funny faces app, Face Camera is what you are in search for. The app can be used outright to capture and make some of the funniest pictures which are incomprehensible. Explore the hidden artist inside you by trying various effects and tools of the Face Camera to create some of the weird and freaky faces using the photos in your gallery. 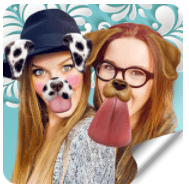 Face Camera features some enriching catalog of face masks, stickers and motion stickers. The effects and filters on the Face Camera are theme based. Each user can choose from a theme of a cartoon, animal, and others. Moreover, you can even swap faces with your friends and family for some quick fun. However, the best part about Face Camera is the artist’s filters wherein one can use the faces of their favorite artists. Also, the real-time video recording feature on Face Camera is something you should try especially with the real-time face change. The feature will change your face in the real-time when recording videos giving it a realistic effect. Planning to make funny cartoon images of your friends face to tease them. If yes, we suggest using the Ugly Camera app. Infamous for making weird cartoon faces, the Ugly Camera is every bit satisfying to make your friends feel embarrassed and uncomfortable. The app can not only take funny photos but also make some funny video movies as well. You can use different filters of distortion, duplication, and transformation to make your friends look ugly and weird. As a user, you can choose from multiple different effects and filter suiting your needs. These effects are quite notorious and transform any beautiful face into an ugly face. Moreover, there is an option to use live filters which serves as a demo prior to capturing an image in that filter or effect. The app is also capable of generating Still Photo, Still Video and Animated GIFs. One must surely use this app to their heart’s content. The app does exactly what the name suggests. Try this app to make all your friends look bald. Give them a complete makeover with a new hairdo by making them go bald. The app is simple and easy to use. 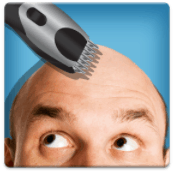 Load up any photo, and you can use the razor icon by hovering it over the head to give a bald look to anyone. The experience feels quite realistic thanks to the razor icon which appears after loaded the photo. However, to use the app correctly, you are required to fit the face of the person as per as the visibly requested frame which appears after exporting the photo the app. Using this app, you can create funny head shaved looks of yourself, your friends and family and enjoy a laughter riot altogether. Moreover, the app even lets you use a complete set of shaving tools and kit to make your experience more realistic. For those unusual major fun moments, Face Change Photo Editor can be your true mate. 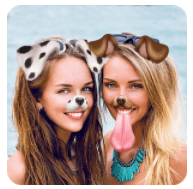 Hailed as a powerful tool for cool photo editing and face changing effects, Face Changer Photo Editor is a popular app across the Android ecosystem. Editing your photo is relevantly simple thanks to the best collection of stickers and filters with this app. From beards, caps, sunglasses, hair to an extensive variety of editing fixes and tools, Face Changer Photo Editor is everything for your needs. Moreover, it also has an option for cartoon and animated filters to help to reap the benefits of enjoyment and fun amongst your group of friends and family. The list aforementioned list consists of top 10 free funny faces apps for Android which can be useful to create some of the funniest and hilarious. Open Play Store on your Android device and bring the excitement and fun to your life by crafting some funny and weird face pictures and share them with everyone to spread the joy of laughter.